NMR, Nuclear magnetic resonance, is a phenomenon which occurs when the nuclei of certain atoms are immersed in a static magnetic field and exposed to a second oscillating magnetic field. It is the best way to analyze structures of organic compound. And this technology has been used in the many fields such as chemicals. 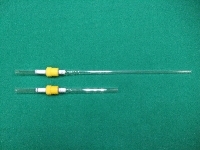 This NMR tube made by WILMAD-LABGLASS is used worldwide and this valve made by J.YOUNG is also used worldwide. It is used for anaerobic sample, T1 measurement and measure of catalyser etc. *You could buy J.YOUNG valves only.